This is a pretty alright air traffic control sim, Radar based and so close to reality that, in the 90s it used to be pretty extensively (and with minimal changes) used as an actual air traffic controller tool/tutorial/simulation, by future air controllers of the era. This, in one short phrase can be translated as, wait for it (!) not much fun! And indeed, this game addresses a very specific niche of simulation users/players, the ones that are looking for a very lifelike tool, that is designed after the specifications of actual RADAR for non military use in the 90s. Thus, while the level of graphical detail is not exceeding, it doesn't even have to be, because, after all, the game only offers you that red RADAR screen and the controls to order flight routes around and that kind of thing. 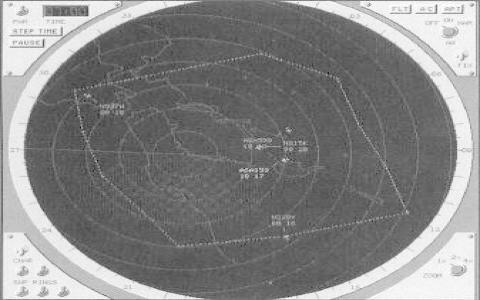 So, yeah, if you want to see what the work of a RADAR operator looked like in the late 80s and early 90s, play it, else, go for an actual flight game, get that adrenaline pumping for real, in, say, yet another very simulation heavy product such as Precision Approach which simulates the ins and outs of landing.